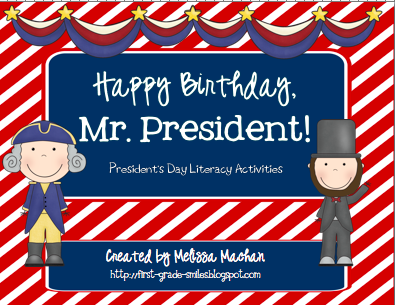 So I've been preparing for Groundhog Day, 100th Day, and Valentine's Day like crazy lately - not to mention working our way through our Penguin Unit........I had kind of forgotten that President's Day is also right around the corner. I hope I'm not the only one. 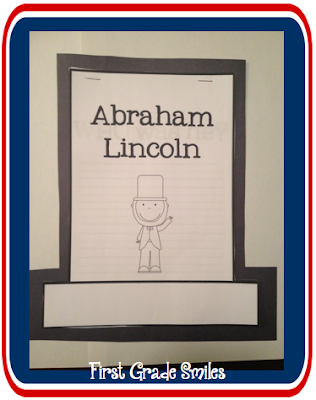 So I sat down to think about what I wanted to teach my students about Lincoln and Washington. I knew I needed something to read with the kids that was appropriate for them to read. I also wanted them to be able to show what they learned. So as my inspiration hit, I decided I needed to work until all hours of many nights in order to finish this President's Day pack. I'm so happy with how it came out - especially knowing that my kiddos will be having fun while learning, which is always my ultimate goal :-) So here it is!!!!! 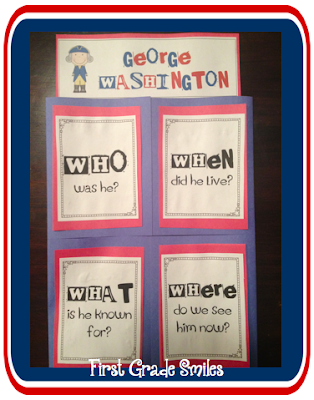 This is a 4-door foldable that opens to reveal lined paper for the students to write what they learned about George Washington. I plan on reading the nonfiction readers with them and then allowing them to reread them with a partner and draw pictures to match each page. After that, we will go over the 4 W's (yes, I know there are 5 W's but I didn't want to get into the why for this project). I wanted something simple enough for my firsties, but still informative and fits in with common core standards, of course. We would then move onto Abraham Lincoln and follow the same format. For this writing activity I made a shape book in the shape of ----- OBVIOUSLY, a top hat. This follows the same format as above, but there are 4 top hat shaped pages for the students to write on with the 4 W Questions. I'm actually a little excited about President's Day now ---- I'm pretty sure that teachers are the only ones that would ever say this! I really like the George Washington and Abraham Lincoln foldable! Thanks so much! I'm excited to use these this year! Super cute! Love your foldables...it's always nice to do learning and a craftivity combined into one! Thanks so much :-))) I agree - I love trying to find at least some way to make things look a little cuter! What a fun idea!! :) Love all the snack ideas! Ha ha - food is the way to anyone's heart, right? I know it is for me :) Hope you have/had fun with President's Day! I gave you a little shout-out tonight! Check it out! Have a great week!